The Sense 3D scanner is trailed as the first consumer scanner in its class to deliver professional performance, a great user experience, and an affordable price. The initial price tag of $399 certainly is cheaper than most of the competition and the Sense should be easily accessible, available as it is on Cubify.com, Staples.com and in hundreds of Staples retail stores across the US. Being hand-held the Sense 3D scanner has flexible scan size and can capture everything from a little rubber duckie, all the way up to a full-body "selfie". The Sense is fast, processing scans in seconds, and outputs instantly 3D printable files. The Sense 3D scanner is hand-held giving the user you the freedom to scan anywhere. It is mobile scanning compatible with the Microsoft Surface Pro 2 tablet. Because the Sense 3D scanner does not rely on a flat-bed or turntable it can scan large objects, up to 10 feet tall and wide. It features auto-optimized settings for small and large objects. Automatic object recognition discards backgrounds, scanning only the object you want. Sense comes with an intuitive user interface with easy and automated zoom, track, focus, crop, enhance and share tools. Sense software is designed to be easy to use and quick, without sacraficing detail. Scans are processed in a matter of seconds and can be cropped, enhanced and solidified for printables in just minutes. The Sense is also integrated with Cubify Sculpt allowing scans to be imported and combined them with other designs. 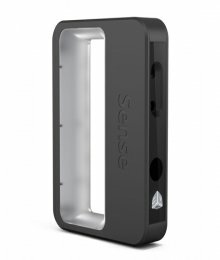 Sense is designed particularly with Cubify.com and the Cube and CubeX 3D printers in mind. Scans can be uploaded directly to Cubify.com for cloud printing with a variety of materials, including Ceramix, Aluminix and Clear, or sent directly to your 3D printer.